President Donald Trump said Wednesday that electronics giant Foxconn will build a $10 billion factory in Wisconsin that’s expected to initially create 3,000 jobs, the largest economic development project in state history. The announcement comes at a critical juncture for a Trump administration that pledged to generate manufacturing jobs but has struggled to deliver results as quickly as the president promised. Trump’s plans for health care and tax cuts face a murky future in Congress, while his administration is bogged down by an investigation into Russia’s possible ties with his presidential campaign. In a White House speech, Trump said the financial commitment by Foxconn CEO Terry Gou was a direct result of his electoral win. But the decision to build the plant in Wisconsin also stemmed from $3 billion in state economic incentives over 15 years if Foxconn invests $10 billion in the state and ultimately adds 13,000 jobs. The incentives would only be awarded if Foxconn creates the jobs and pays an average salary of nearly $54,000. The Wisconsin factory, scheduled to be open by 2020, would be massive. The campus dubbed “Wisconn Valley,” would cover nearly 1.6 square miles and be three times the size of the Pentagon. Foxconn’s plant will produce liquid-crystal display panels, or LCDs, that are used in televisions and computer screens. The factory will be located in the congressional district of House Speaker Paul Ryan. It would mark a substantial gain for a state that currently has 472,000 manufacturing jobs and is still recovering from factory layoffs – including the closure of a General Motors plant in Ryan’s hometown – that hit after the 2008 financial crisis. Taiwan-based Foxconn is perhaps best known for assembling Apple iPhones in China. The company noted in a statement that having the Wisconsin factory would help it better serve the major U.S. technology companies that are its clients. Seven states had competed for the Foxconn plant. By awarding the plant to Wisconsin, Foxconn would appear to be giving a victory to both Trump and the state’s Republican governor, Scott Walker, who is up for re-election next year. Other states that vied for the plant are Michigan, Illinois, Indiana, Ohio, Pennsylvania and Texas. 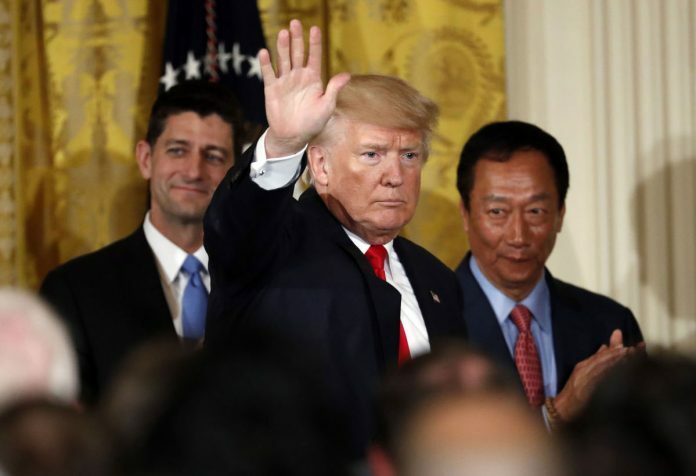 Foxconn said in a release the announcement was just the first of several investments the company will be making in the U.S.
Walker and several other Wisconsin officials, including Ryan, attended the White House announcement. Landing the multistate competition has been cast as a once-in-a-generation opportunity. Foxconn is the biggest contract assembler of smartphones and other devices for Apple and other brands. It has been eyeing building the plant in a part of Wisconsin represented by Ryan, who said he has met with company officials at Walker’s request. Critics have cautioned that Foxconn has made promises before to invest in the U.S. and not followed through. Foxconn promised in 2013, for example, to invest $30 million and hire 500 workers for a new, high-tech factory in Pennsylvania that was never built. State Sen. Alberta Darling, co-chair of the Wisconsin Legislature’s budget committee, said any deal would be examined with a “fine-toothed comb” and need to win approval by the Republican-controlled Legislature. Walker said he planned to call a special legislative session to consider the incentives. They include up to $1.5 billion in income tax credits for job creation, $1.35 billion in income tax credits for capital investment and up to $150 million in a sales tax exemption for the purchase of construction materials. White House chief of staff Reince Priebus, who is from Ryan’s congressional district in southeast Wisconsin, told WTMJ-TV on Tuesday that Trump, when flying over the area in Kenosha County during a visit to Wisconsin in April, noticed vacant land where a former Chrysler Motors plant used to be. That part of the state is an attractive location for a large plant because of the area’s proximity to Lake Michigan and its abundant water supply. To make flat-panel displays, the company will need access to great quantities of water to keep work spaces dust-free, among other things. The news sent a jolt of excitement across Wisconsin, even among longtime Democratic critics of Walker. “It’s an exciting opportunity,” said Democratic state Assembly Minority Leader Peter Barca. Barca, like many Democrats, voiced concern about how much taxpayers may have to contribute in tax breaks and other incentives. Foxconn will Build a $10 billion factory in Wisconsin. It expected to initially create 3,000 jobs, largest economic development project in state history.